Green Fees: £37 Weekday, After 2pm Saturday & After 1pm Sunday. £47 All Day. Offers: Accepts 2fore1 vouchers plus discounts associated with 'Open Fairways' and 'Kent Golf Union'. Plus offers discounts to groups of 12 or more golfers. Full bar and catering; Changing rooms; Professional shop; Teaching facilities; Practice areas; Trolley & Buggy Hire. Faversham Golf Club has a long standing reputation for being a very friendly club and always receives favourable comments from the many visitors. The new clubhouse was opened in the mid nineties. This impressive building was officially opened in December 1997. In addition to an administration office, men's and ladies locker rooms and the Pro's shop on the ground floor, it has a large bar and dining area, kitchen and a function room on the first floor. Patio style doors from the bar lead to an outside veranda which provides some excellent views of the course. The long established parkland course at Faversham is both beautiful and demanding. Tight tree lined fairways demand accuracy of the tee, and the wonderfully kept greens will reward a well struck putt. Visitors in either small parties of golfers or as golf socities are welcome at Faversham Golf Club by prior arrangement. Small numbers can be possibly be accomodated at short notice but this cannot be guaranteed. 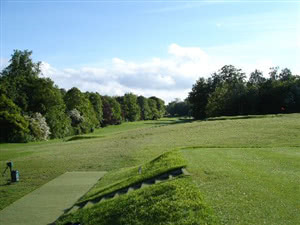 Faversham GC is a par 70 parkland style course located in Belmont Park, a few miles outside Faversham, Kent. Access to the course is via a couple of narrow largely single track lanes with limited passing lay-by's. Be ready for a possible standoff or two! The club was founded in 1902 as a 9 holer, and was relocated to its present location in 1911. The course was extended to 18 holes in the 1920s. The course comprises 4 par 3s, 12 par 4s and 2 par 5s. The course is a real challenge to the club golfer. There are tricky slopes, large undulating greens, blind approaches, well placed fairway bunkers, and green-side bunkers, including several greens totally surrounded by bunkers. Whilst the course was generally in very good condition given the hot summer and recent rains; unfortunately the greens are not at their best not having recovered from recent spiking/sanding. The par 4 6th (Punchbowl) and par 3 16th (Porter's Folly) were particularly tricky blind/semi blind approaches to relatively small greens. The clubhouse is relatively modern being built in 1997. The clubhouse was opened by their club member and Tour Professional, Roger Chapman; of US Seniors Open fame. Former Curtis Cup player Micky Walker, is also associated with the club. I wouldn't describe this as a 'hidden gem' course but nevertheless it is a little out of the way vis a vis South West London, but it is a a course I feel fellow TSGers would not be disappointed with! There is a lovely 'half way' house adjacent to the 7th tees and 12th green. Visitor green fees are £ 38 or £30 with a County Card. Weekday/weekend member guest rates are £25/£29 respectively. I had the honour to represent Cherry Lodge GC Vet's in the Kent Vet's League Club Pairs betterball competition with Dennis Shipp (9 handicapper). We scored 39 points. The winning score was 42 points, achieved by the Faversham GC 'home' pair on countback. Local knowledge obviously helps! Only 7 of the 48 club pairs scored better than Dennis and I. This was a truly vfm game as the competition entry fee of £20 per player, for the pre-match coffee/bacon bap, 18 holes and two course meal, is refundable by our CLGC Vet's! Apart from the condition of the greens, the unavailability of a course planner/shotsaver was a big disappointment, which was compounded by the absence 'hole diagrams' on any of the tee boxes. Lovely Course, Although A Little Pricey !! Faversham Golf Course is a lovely parkland layout with well maintained tees, fairways and greens although the latter were very quick and could be easily three putted on. The first cut off the fairways, although not long, was very thick and tough to hit out of. It's not the longest course in the world but this is not your run of the mill golf course, fairways are mostly tight and there are many bunkers all in the right places to catch even those slightly wayward shots. The Full English Breakfast was excellent and all the staff were very pleasant, even the Head Pro, Stuart, shook my hand when I turned up at his shop. The price is slightly too high, so wait for that deal before going along and make sure you're on your "A" Game as, if not, this course will beat you up.